Our Lady of Guadalupe (Nuestra Señora de Guadalupe), also known as the Virgin of Guadalupe (Virgen de Guadalupe), is a title of the Virgin Mary associated with a famous pictorial image housed in the Basilica of Our Lady of Guadalupe in México City. 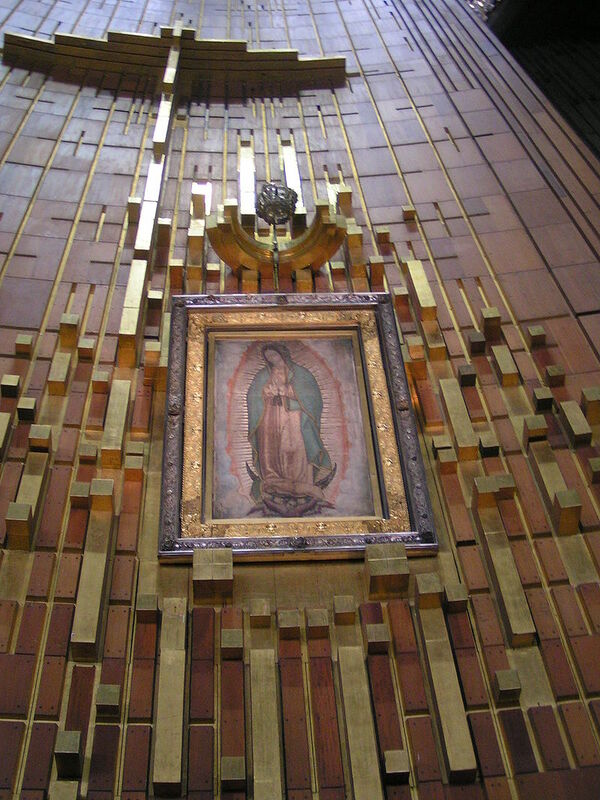 The Basilica of Our Lady of Guadalupe is the most visited Catholic pilgrimage site in the world, and the world’s third most-visited sacred site. Official Catholic accounts state that the Virgin Mary appeared four times to Juan Diego Cuauhtlatoatzin (1474–1548), and once more to Juan Diego’s uncle. 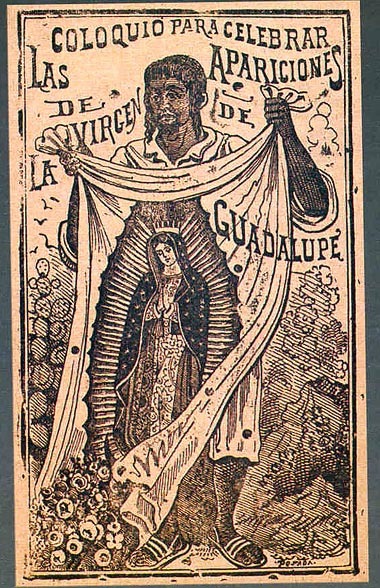 According to these accounts the first apparition occurred on the morning of December 9, 1531, when Juan Diego, a native Mexican peasant, saw a vision of a maiden at a place called the Hill of Tepeyac, which would become part of Villa de Guadalupe, a suburb of Mexico City. Speaking to him in his native Nahuatl language, the maiden identified herself as the Virgin Mary, “mother of the very true deity” and asked for a church to be built at that site in her honor. Because of her words, Juan Diego sought out the archbishop of Mexico City, Fray Juan de Zumárraga, on the same day to tell him what had happened. The bishop did not believe Juan Diego, but later that day, Juan Diego saw the Virgin Mary for a second time (second apparition) and asked him to keep insisting. 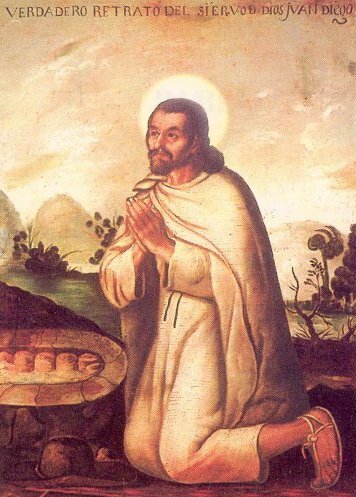 On Sunday, December 10, Juan Diego talked to the archbishop for the second time, who then instructed him to return to Tepeyac Hill, and ask the lady for a miraculous sign to prove her identity. That same day the third apparition occurred in which Juan Diego returned immediately to Tepeyac and, encountering the Virgin Mary, reported the bishop’s request for a sign; she consented to provide one on the following day (December 11). By Monday, December 11, however, Juan Diego’s uncle Juan Bernardino had fallen sick and Juan Diego was obliged to attend to him. In the very early hours of Tuesday, December 12, Juan Bernardino’s condition having deteriorated overnight, Juan Diego set out to Tlatelolco to get a priest to hear Juan Bernardino’s confession and minister to him on his death-bed. 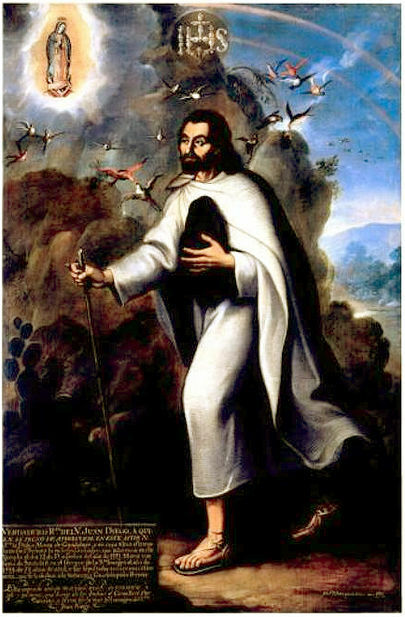 In order to avoid being delayed by the Virgin and embarrassed at having failed to meet her on the Monday as agreed, Juan Diego chose another route around the hill, but the Virgin intercepted him and asked where he was going (fourth apparition); Juan Diego explained what had happened and the Virgin gently chided him for not having had recourse to her. 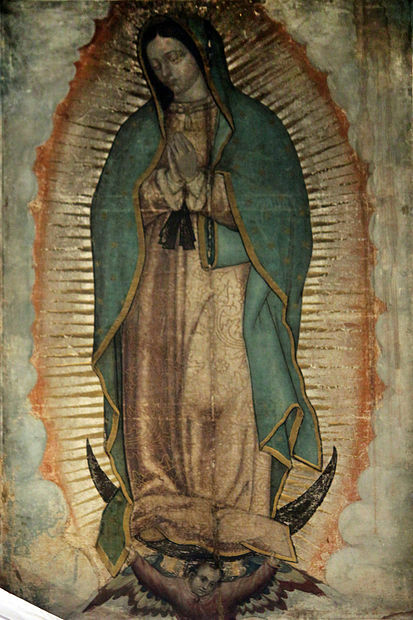 In the words which have become the most famous phrase of the Guadalupe event and are inscribed over the main entrance to the Basilica of Guadalupe, she asked: “No estoy yo aqui que soy tu madre?” (Am I not here, I who am your mother?). She assured him that Juan Bernardino had now recovered and she told him to gather flowers from the top of Tepeyac Hill, which was normally barren, especially in December. Juan Diego followed her instructions and he found Castilian roses, not native to Mexico, blooming there. Juan arranged the flowers in his tilma (cloak), and when he opened his cloak before archbishop Zumárraga on December 12, the flowers fell to the floor, and on the fabric was the image of the Virgin of Guadalupe. The bishop kept Juan Diego’s tilma, first in his private chapel, and then in the church on public display where it attracted great attention. On December 26, 1531 a procession formed for taking the miraculous image back to Tepeyac where it was installed in a small hastily erected chapel. In course of this procession, the first miracle was allegedly performed when an Indian was mortally wounded in the neck by an arrow shot by accident during some stylized martial displays executed in honor of the Virgin. In great distress, the Indians carried him before the Virgin’s image and pleaded for his life. Upon the arrow being withdrawn, the victim made a full and immediate recovery. Juan Diego’s tilma has become Mexico’s most popular religious and cultural symbol, and has received widespread ecclesiastical and popular support. In the 19th century it became the rallying call of American-born Spaniards in New Spain, who saw the story of the apparition as legitimizing their own Mexican origin and infusing it with an almost messianic sense of mission and identity – thus also legitimizing their armed rebellion against Spain. 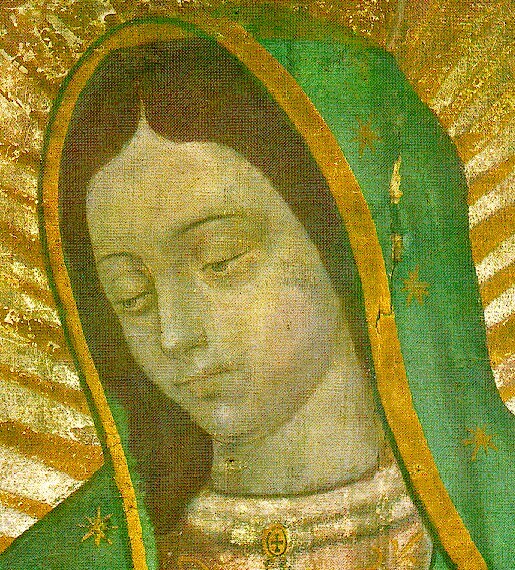 Historically the devotion to Our Lady of Guadalupe did not lack clerical opponents within Mexico, especially in the early years, and in more recent times some Catholic scholars, and even a former abbot of the basilica, Monsignor Guillermo Schulenburg, have openly doubted the historical existence of Juan Diego. Nonetheless, Juan Diego was canonized in 2002, under the name Saint Juan Diego Cuauhtlatoatzin. What is purported by some to be the earliest mention of the miraculous apparition of the Virgin is a page of parchment (called Codex Escalada) which was discovered in 1995. This document bears a pictorial representation of Juan Diego and the apparition, several inscriptions in Nahuatl, referring to Juan Diego by his Aztec name, and the date 1548. Doubts have been cast on the authenticity of the document, however. A more complete early description of the apparition occurs in a 16-page manuscript called the Nican mopohua, which was acquired by the New York Public Library in 1880, and has been reliably dated to 1556. This document, written in Nahuatl, but in Latin script, tells the story of the apparitions and the supernatural origin of the image. It was probably composed by a native Aztec man, called Antonio Valeriano, who had been educated by Franciscans. The text of this document was later incorporated into a printed pamphlet which was widely circulated in 1649. In spite of these documents, there are no written accounts of the Guadalupe vision by Catholic clergymen of the 16th century, as there ought to have been if the event had the importance it is claimed to have had. In particular, the canonical account of the vision features archbishop Juan de Zumárraga as a major player in the story, but, although Zumárraga was a prolific writer, there is nothing in his extant writings that can confirm the story. This is the most important omission in the verification of the tale. The devotion at the chapel . . to which they have given the name Guadalupe was prejudicial to the Indians because they believed that the image itself worked miracles, contrary to what the missionary friars had been teaching them, and because many were disappointed when it did not. 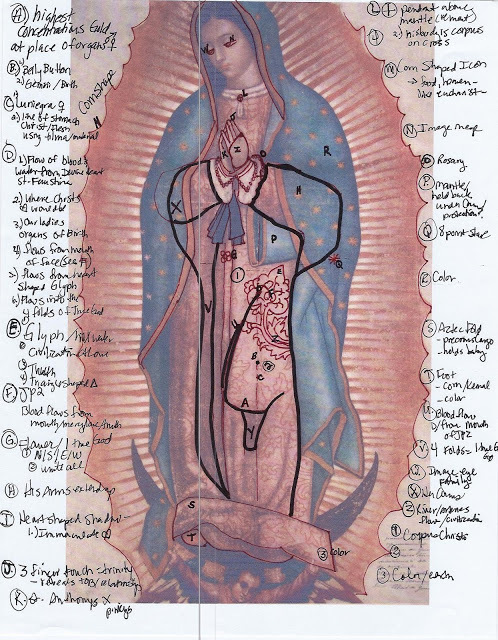 The report of the 1556 inquiry is the most extensive documentation concerning the Virgin of Guadalupe from the 16th century, and significantly, it makes no mention of Juan Diego, the miraculous apparition, or any other element from the legend. If the miracle story did have currency at that time, it seems strange that it would have been omitted from this report. In the late 1570s, the Franciscan historian Bernardino de Sahagún denounced the cult at Tepeyac and the use of the name “Tonantzin” to call Our Lady in a personal digression in his General History of the Things of New Spain, in the version known as the Florentine Codex. At this place [Tepeyac], [the Indians] had a temple dedicated to the mother of the gods, whom they called Tonantzin, which means Our Mother. There they performed many sacrifices in honor of this goddess…And now that a church of Our Lady of Guadalupe is built there, they also call her Tonantzin, being motivated by the preachers who called Our Lady, the Mother of God, Tonantzin. It is not known for certain where the beginning of this Tonantzin may have originated, but this we know for certain, that, from its first usage, the word means that ancient Tonantzin. And it is something tha should be remedied, for the correct [native] name of the Mother of God, Holy Mary, is not Tonantzin, but Dios inantzin. It appears to be a Satanic invention to cloak idolatry under the confusion of this name, Tonantzin. Sahagún’s criticism of the cult seems to have stemmed primarily from his concern about a syncretistic application of the native name Tonantzin to the Virgin Mary. However, Sahagún often used the same name in his sermons as late as the 1560s. In the 16th century and probably continuing into the early 17th century, the image was modified by adding the sunburst around the Virgin, the stars on her cloak, the moon under her feet, and the angel with folded cloth supporting her – as was determined by an infrared and ocular study of the tilma in 1979. Neither the fabric (“the support”) nor the image (together, “the tilma”) has been analyzed using the full range of resources now available to museum conservationists. Four technical studies have been conducted so far. Of these, the findings of at least three have been published. Each study required the permission of the custodians of the tilma in the Basilica. However, Callahan’s study was taken at the initiative of a third party: the custodians did not know in advance what his research would reveal. MC – in 1756 a prominent artist, Miguel Cabrera, published a report entitled “Maravilla Americana,” containing the results of the inspections by him and six other painters in 1751 and 1752. G – José Antonio Flores Gómez, an art restorer, discussed in a 2002 interview with the Mexican journal Proceso, certain technical issues concerning the tilma. He had worked on it in 1947 and 1973. (1) Support: The material of the support is soft to the touch (almost silken: MC; something like cotton: G) but to the eye it suggested a coarse weave of palm threads called “pita” or the rough fiber called “cotense” (MC), or a hemp and linen mixture (R). It was traditionally held to be made from ixtle, an agave fiber. (2) Ground, or primer: R asserted (MC and PC contra) by ocular examination that the tilma was primed, though with primer “applied irregularly.” R does not clarify whether his observed “irregular” application indicates that the entire tilma was primed, or just certain areas – such as those areas of the tilma extrinsic to the image – where PC agrees there are later additions. MC, in contrast, observed that the image had soaked through to the reverse of the tilma suggesting a lack of primer. (3) Under-drawing: PC asserted there was no under-drawing. (4) Brush-work: R suggested (PC contra) there was some visible brushwork on the original image, but in a minute area of the image (“her eyes, including the irises, have outlines, apparently applied by a brush”). (5) Condition of the surface layer: PC reports that the un-retouched portions of the image, particularly the blue mantle and the face, are in a very good state of preservation, with no flaking or peeling. The three most recent inspections (G, PC and R) agree (i) that additions have been made to the image (gold leaf added to the sun’s rays-which has flaked off; silver paint or other material to depict the moon – which has discolored; and the re-construction or addition of the angel supporting the Marian image), and (ii) that portions of the original image have been abraded and re-touched in places. Some flaking is visible, though only in retouched areas (mostly along the line of the vertical seam, or at passages considered to be later additions). (6) Varnish: The tilma has never been varnished. (7) Binding Medium: R provisionally identified the pigments and binding medium (distemper) as consistent with 16th – century methods of painting sargas (MC, PC contra for different reasons), but the color values and luminosity are in good condition. You’ll have to make of it what you will. There is no question that the original image is in a good state of preservation, and subsequent additions have all deteriorated. The lack of contemporary eye witness accounts of the legend is not encouraging. However, I find it odd that the image depicts a young mestiza woman at a time when mestizos (male or female) were an extreme rarity, if they existed at all. 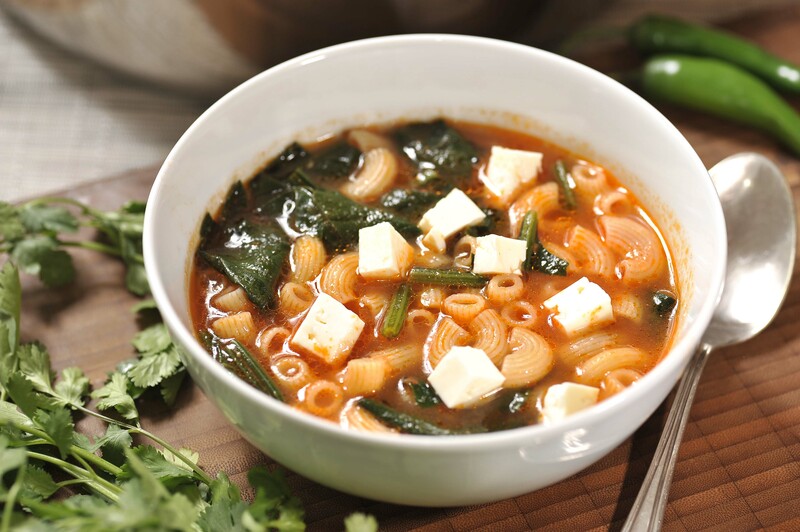 I have chosen a Mexican festive dish to honor Guadalupe that could be part of a celebratory meal — sopa de coditos y espinacas (macaroni and spinach soup). I’ve given the recipe in Mexican Spanish but it’s very easy to read, I believe, even if your Spanish is limited (Google translate will do the trick too). I mean, what’s complicated about cooking spinach and elbow macaroni in a chicken and tomato broth with onions and garlic? Some cooks add epazote for flavoring. It’s also common to add chunks of soft white cheese (queso blanco). Licua el jitomate, con la cebolla, el ajo y el consomé. Calienta el aceite y fríe la salsa anterior y cocina por 5 minutos, agrega el caldo los coditos y las espinacas. Cocina por 10 minutos más o hasta que rompa el hervor. Sirve con el queso parmesano.